This beautiful house for sale has 5 bedrooms, 3.5 bathrooms and is located in a secure gated community. The back of the house looks into the jungle, and beyond you can see a peek at the ocean and feel its breezes. There is a lovely mountain view from the front terrace of the house. As you drive up to the house you will be able to park two vehicles and an ATV in your huge carport and still have extra space for guests. 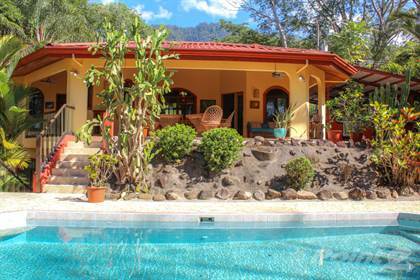 The property is fully and maturely landscaped, with tropical palms and cactus among others. The main living area is all on one level, which includes a kitchen with plenty of cabinetry, living room, bathroom, laundry room, 2 bedrooms, the master suite and a spacious covered terrace. The dream kitchen has granite counters, a large island with breakfast bar, and every appliance you could possibly need. The lower level features 2 more bedrooms with a shared bathroom. With this many beds & baths, the entire house could accommodate several families or couples, if you’re looking for a rental property now that could be your home in the future. The layout of the house lends another option, for you to live upstairs and AirBnB or VRBO the lower “guest rooms” to generate a supplemental income if desired. The pool is large and surrounded by a beautiful patio. There is a built in BBQ/bar area at the back of the carport, adjacent the pool. This property is well-designed for tropical living, with plenty of space for entertaining, romantic dining or just quietly lounging and reading a book. This property is turnkey. The quality furniture, appliances, household items, and linens are included. The house comes equipped with Phantom screens through out. There are also 2 storage bodegas, one in the carport and another under the pool. The house was constructed using Coven Tec construction, which is concrete double sided with Styrofoam for added insulation. The roof is steel beam construction and double insulated. EXCITINGLY NEW! 3 bedroom open-concept home, complete with pool and carport. 0.56 ACRES - 2 Bedroom Home With Pool Plus 1 Bedroom Guest House In Ojochal Village!! Hi, I'd like to find out more information about Five Bedroom House in Ojochal. Thanks so much!